transfer for supporting the local collaborative sustainable development processes. Traditional knowledge management or business knowledge management packages are typically based on organizational objectives such as improved performance, competitive advantage innovation, lessons learning, transfer between projects and the general development of collaborative practices. Today many business companies and development agencies have resources dedicated to knowledge management, through or often as a part of information management or human resource management departments. These business knowledge packages are focused on the intern organization´s visions, values and strategies through actions like information management in order to successfully perform the jobs, knowledge platform, forum, seminar, connecting people to documents, producing papers, learning materials, communications and marketing etc. Knowledge Management for development format may be distinguished from traditional knowledge management format or business knowledge management format by a greater focus on specific sustainable knowledge development assets and the development and cultivation of the local right sociocultural knowledge infrastructures through which knowledge for development are transferred. The right knowledge for development should be the ”practical knowledge for development” that must be more focused on the development of the capacities of the local communities in helping the communities to drive and to promote their own sustainable development processes through suitable evaluation processes, through the right adequate local sociocultural infrastructures, through effective collaborative and participatory approaches with governments, private sector, PPPs, NGOs etc. with the respect of the local resources and potentials, at the right place and at the right moment. Practical knowledge management for development supports effective value collaboration and individuals in knowledge management and knowledge transfer over hierarchies, monopoles, processes etc. through training, discussing, interaction and evaluating, exchange, education, openness etc. The local communities know what is going on. Knowledge providers know and do perfect what needs to be done to get and to distribute the right local knowledge management format and infrastructures. I understand the practical knowledge for development platform as a practical cultivation of an environment within which different people, different organizations, different knowledge producers etc. where they are, are willing to share, to learn and to collaborate together leading to improvement in mobilizing, providing and getting access to the right, local sociocultural knowledge infrastructures and knowledge management procedures. Knowledge for development should be the pragmatic discipline and process of enabling individuals, teams, entire organizations, governments, universities, public sector, private sector, development agencies, and knowledge providers, knowledge producers etc. to collectively and systematically create, share and apply knowledge to better achieve the Millennium Development Objectives. Successful practical knowledge for development requires new knowledge culture. This culture requires Change and Adaptation. This means doing and making things that are different and better, not merely different. I could underline that not everything that is different is better, but anything that is better is different to before. Knowledge for development processes provide the materials and tools for all stakeholders to set up, manage and control their own systematic lean and agile knowledge management innovation processes. These will help to deliver measurable value in knowledge management for development to both target communities and t to the knowledge producer. Agile knowledge management for development encourages live collaboration, work and engagement and values the social, economic and environmental well-being of beneficiaries over sample knowledge management processes, instruments and systems etc. It responds to change of social, economic, environmental well-being rather than rigidly sticking to long term knowledge management planning. Agile knowledge management for development works with collaborative and participatory approaches. Knowledge development stakeholders and beneficiaries know enough what happens and what needs to be done. They learn from each other, exchange practical knowledge, feedback etc. They trust each other and communicate effectively with one another. Agile knowledge management for development is a school of learning and discipline in knowledge for development management and transfer. It offers practical opportunities to communicate and to cooperate effectively, allows stakeholders, communities and beneficiaries to benefit from the talents, skills, knowledge and technologies of others and to transfer these talents, skills, knowledge and technologies etc. to poor areas through adaptive knowledge development processes. Agile knowledge management for development promotes and drives people and interactions over virtual management, virtual platform and supports face to face, discussion, workshop, accomplishment, hardworking on the field with local communities or beneficiaries, feedback periodically on the economic, social, cultural and environmental impact on the well-being of the beneficiaries. It encourages live interactions with stakeholders, beneficiaries, communities and governments. Agile knowledge management for development encourages the willingness to listen and to understand with good will the economic, social, cultural and environmental requirement context for providing the right socio-cultural infrastructures in knowledge management and the right knowledge for development purposes that respond better to the need for basic well-being support and emergency with local good structures, and with good political management of local, global resources and development aid. Agile knowledge management for development provides the opportunities for local actors, beneficiaries, communities to get progressive the chances and the responsibilities to develop their own socio economic and cultural sustainable community through the right sociocultural infrastructure in all domains. It aggressively seeks to produce and to get access to the local right adequate sociocultural knowledge management and transfer for development infrastructures through collaboration and participation processes. Effective knowledge management and transfer for development require basic adequate sociocultural knowledge management and transfer infrastructures like building, physic platform, virtual platform, education and training model, acces to ICT infrastructures, rural development center, professional engagement for sharing and transferring the right knowledge. Copy/paste or peer to peer replication of successful knowledge for development and transfer towards others regions could not work everywhere because of the local and regional sustainable development environment requirements (education, culture, religion, nature, environment, potentials, ethnic structure, economic structure, natural resources, communities, politic etc.) disparities, the differences in availability of local adequate sociocultural knowledge management and transfer infrastructures and resources for development. Decentralized knowledge management and transfer for development process could be the right solution in knowledge management and transfer for development. 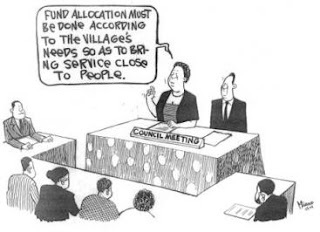 Therefore knowledge management and transfer decisions are making local with the local communities, local beneficiaries and their representatives. These decisions are taking into consideration within the development program and increase collaborative and participatory sustainable development accountability, approaches and effectiveness. Decentralized knowledge management and transfer for development allow to matching sustainable development services to needs. These could bring local knowledge management, knowledge transfer and aspiration into development project design, implementation, management and evaluation and could help local, regional development agencies to better match actions to local sustainable development requirement. 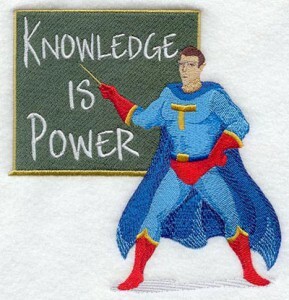 Decentralized knowledge management and transfer for development could effective bring communities, NGOs and development agencies together, and increase sustainable development efficiency by helping to tap the local knowledge management and transfer know-how, creativity and resources of local communities and beneficiaries. A decentralization of knowledge management and transfer could support the effectiveness of coordination and flexibility knowledge management and transfer strategies among local and international development agencies and in planning and implementation of common knowledge management and transfer platforms and centers. Local knowledge management and transfer platforms and centers could provide local communities, beneficiaries with knowledge management and transfer talents, skills, knowledge infrastructures access and materials etc. and can contribute to effective local sustainable development. These could allow the right decisions, the right information, and the right knowledge for development at the right place and at the right time. These platforms and knowledge centers could support effective knowledge management, sharing and transfer through effective collaborative and participatory approaches with communities, beneficiaries, governments, local, regional development agencies etc. Decentralized knowledge management, and knowledge transfer for development support flexible decisions making with greater communities’ participation and more relevant to diverse interests in sustainable communities’ development in knowledge management and transfer for development. A pragmatic knowledge transfer could take place on the actual development program site with task accomplishment as a part of the process, involves learning skills, sharing talents and applying knowledge hands-on and on-development-processes following or as a part of a defined structured learning process. The decisions are made with greater participation to better inform and are more relevant to diverse interests in communities. Furthermore local and regional knowledge management staff could direct interact effective through collaborative and participatory knowledge management and transfer approaches with remote communities, beneficiaries, governments and with others local and regional development agencies, private and public development sphere etc. This allows local and regional knowledge management staff to drive and to promote together North-South collaboration, South-South collaboration and quick access to development information, idea, expertise, technical assistance, cooperation and training etc. in knowledge management and transfer for development. Decentralized knowledge management and knowledge transfer align all aspects of knowledge management and transfer for development with the wants and the needs of the communities’ sustainable development. It encourages to simplify the implementation of the central knowledge management and transfer for development strategies towards local communities that enables stronger participation of local communities, beneficiaries, governments and civil society to meet local sustainable development needs and expectations. governments, public and private sector, Public-Private Partnerships(PPPs), NGOs and communities. It could lead too to cultures challenging and barriers (language, ways of thinking, ways of seeing, ways of hearing, ways of feeling and interpreting a sustainable development context and situation etc.) and to local/regional communications challenging and barriers (communication errors, communication noise, ineffective communication model and concept, mis-communication, misunderstanding, unsuccessful communication strategy etc.). Decentralized knowledge management and transfer for development needs more works, effective evaluation through pilot projects, case studies, plan and test, monitoring, evaluation, feedback, training, live collaboration, management, construction of rural/remote knowledge development center, traditional information materials etc. This may need more resources (human, capital, infrastructures etc.). Decentralized knowledge management and transfer for development require agile and holistic management procedures and processes like evaluating and measuring what works in the basis before beginning and this may take time before the right implementation and operations occur. Decentralized knowledge management and transfer for development require high roles, responsibilities and high professional engagement with more disciplines and cultural background. 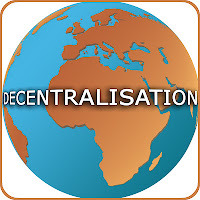 Decentralized knowledge management and transfer for development must absolute seek to redistribute fairly the authority, the responsibility and the knowledge resources among different levels of communities, regions, governances etc. Decentralized knowledge management and transfer for development mean the transfer of the responsibility of the planning, the transfer of the responsibility of the financing of knowledge providing and management from the central or regional knowledge management center and its agencies towards local communities, local governments, local beneficiaries etc. Knowledge management and transfer are absolute and important raw materials for sustainable development and working with effective knowledge management and transfer towards target communities through the right sociocultural infrastructures are the most important processes in sustainable development programs. Decentralized knowledge management and transfer for development could provide more chance to promote and to drive the most respective local, and regional sustainable development environment expected from development agencies and programmes. The successful knowledge management and transfer packages for development should be carefully targeted towards its audience, with the right mixture of simplicity, elegance and sustainable communities development innovations through the right knowledge formats and infrastructures. To conclude "Knowledge for development" is a cross-functional knowledge package, within we could refer the "business knowledge" as the "output" and the "knowledge for development" as the "outcome". You may be interested in the following paper: How Knowledge can Impact Development? Author, Amouzou Bedi, sample paper, contact on linkedin. I will try to update this paper on a regular basis if a need arises. Please If you requires an explanation, or you have a suggestion and feedback with regards to this paper, please feel free to contact me. Thank you in advance for your collaboration.